This morning my I Love This Box showed up! I was REALLY interested to see what would be in the box. They announced at the start of the month that subscription would cost $19.95 per month for new members. If you're an existing member you will only be charged the introductory price of $14.95. Is the price increase worth it? I'm really excited to try this. I haven't used Avado before. This is for dry or sensitive skin. It contains Aloe Vera and avacado oil to hydrate and protect your skin. It's also salfate free and made in Australia. This has a gorgeous smell and really made the box smell nice. It's incredibly moisturising with ingredients such as Macadamia nut, shea nut, olive and coconut. This is made in Australia. I was so excited when I saw this on the card. I have seen the ads on TV and couldn't wait to try it. But my excitement went to disappointment when I saw the colour. It is called "Get Nutty" and is a dark brown with a hint of red. It's much to dark for my skin type and is not a colour I would ever wear. But it does feel really soft on my lips and is really smooth. I'll have to pick up another colour in the future! While I don't like chocolate colours on my lips I do on my eyes and received a gorgeous shimmery bronze/brown. I LOVE this colour! While it's sheer, you can build up the colour. This is the standout product in the box! As nice as this looks, it ended up spilling in my box :( The packaging is quite bad, since it is in a small plastic bag and because the product was on the packaging, it covered the sticky tape that was supposed to stop it spilling. It also doesn't say what it is, just the name of the brand on the packaging. You either got a mineral bronzer or a blush. I received the blush. It is a gorgeous shimmer blush, but sadly the packaging it terrible, and there isn't much left to use. There was a voucher to receive $5 off any Avado Organics Sensitive Skincare product from Priceline. There were also two cute little easter eggs. Overall I like the box. The value is there. The soap, eyeshadow, lipstick and exfoliant equal over $60. Sadly because the blush spilled into the box and the lip colour wasn't suitable, it wasn't the best box for me. But if the colour was better and the blush was in better packaging, I would have LOVED the box. What did you think of your box? What colours did you get? If this is your first box, is $19.95 worth it? This month's box seems to be much more disappointing than the previous months eh? Lucky us to only be paying the introductory price cuz the $5 increase doesn't seem worth it at all..
Yeah I'm so glad that I was already a member, as I probably wouldn't purchase the box if it was $20 a month. Shame you don't like the lipstick on yourself, it looks like a lovely deep red in the pic. I love red lipstick but it doesn't love me...as i have very small lips and the red just makes them appear smaller! I can see that you do get your value for money, but in comparison to other boxes i think i love this box has made a big mistake by upping the price. 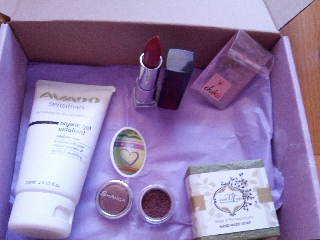 March's bellabox came to over $66 worth of value, and that is only the standard $15 box. Upping the price and providing about the same amount of samples as before/their competition is only going to drive new customers away. Lucky you only have to pay $14.95 though! I think the boxes are good value (haven't gotten mine yet this month so who knows) but I think I'm going to have to stop. Too many hand creams, glosses and mascaras at home because of these boxes! It looks like a nice enough box, hope I get a nice lipstick shade though, this one would be awful on me! I'm glad that we get to keep the normal price, kind of exciting though to think there might be a higher value in the boxes due to the price increase! have to agree about the 'chikii' packaging.. and the colour of the lipstick while it is a nice colour..not really suitable for me I got the same colour as you. Ohhh that's a shame Liz. Its so difficult when it comes to colours. It's just luck of the draw. I received mine today. Very disappointed I must say. Mine was a bit different to yours. I've decided to unsubscribe from ILTB. Just saw your blog post. I love the candle!!! I probably would have liked that more than the soap.